Bottle gourds are one of the favorite vegetables of Indians and have numerous health benefits. Bottle gourd is rich in vitamins and especially in minerals which the body requires during the hotter months of the year. Cooked lauki is cooling, calming and acts as diuretic. It makes you relax after eating. 1. Peel and discard the seeds of bottle gourd. Grate the gourd. 2. Heat one tablespoon of ghee in a pan and fry the cashew nuts on a medium flame until they turn brown in colour. 3. Keep them aside and add the grated bottle gourd in the same pan. 4. Fry it until the raw smell goes stirring continuously. 5. Now pour in the milk and stir well. Let the doodhi cook on medium-high till the milk is nearly absorbed. Stir every once in a while. 6. Now add the sugar. Cook it for 7-8 minutes on a medium flame. 7. When the halwa becomes thick, add the remaining ghee and crushed cardamom. 8. Turn off the stove and serve it hot or chilled. 9. Serve hot garnished with Raisins, flaked almonds and pistachios. (I used a cherry also in the picture). 10. Bottle gourd halwa can be enjoyed warm with Vanilla ice-cream or chilled just a bit on its own. My version is quite gooey if you like it that way. Tip:- Add 1-2 drops green color if you want appealing halwa . What a nice & delicious treat . Looks great . I love halwa & surely try your version too . I have neve rhad halwa with this veg, looks really sweet and yumm. 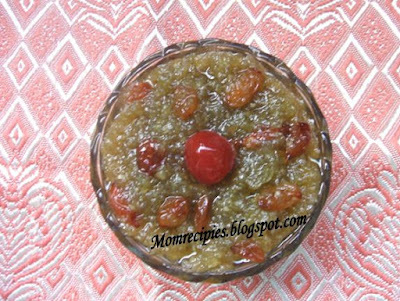 Hey sereesha..first time to ur blog i suppose.I was looking for doodhi halwa recipes and stumbled upon urs...lovely one.Thanks for sharing! Even i posted this some time back gal..
Oh this looks absolutely delectable! Lovely dessert to have after a full fledged meal! nice sweety tempting halwa Siri! Very unique halwa, sounds interesting ! wow noru vuruthundi..chala bagundi yummy.. I usually end up making koftas with these... Halwa looks awesome.